Supply chain management includes coordinating and collaborating with partners at all levels, who serve as links to the end users, to ensure that commodities are available when and where they are needed, thereby avoiding wastage and expiry. To strengthen DRC’s interventions and coordinate its supporting partners, SIAPS has supported the country in implementing 10 Provincial Medicines Committees (CPMs). Since 2012, this support has reinvigorated collaboration among stakeholders in each province. 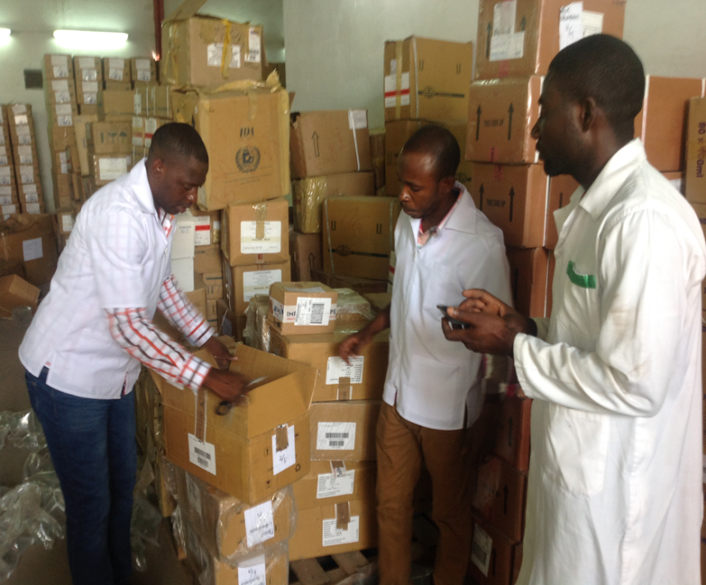 The supply chain and distribution of medicines in Haut-Katanga Province have been affected by the frequent overlap of medicines, including antimalarials; multiple entries; parallel supply circuits in health facilities; no information sharing among partners who are supporting the sector; and the use of a commodities push supply method rather than a pull method, which disregards the coordination unit (i.e., the health zone’s warehouse). As a result, some health facilities experienced expiries, while others nearby lacked basic commodities. From left to right: Pharmacist Trainee Pierre Monga (CAMELU, Lubumbashi’s warehouse); Pharmacist Pacifique Bwenge (SIAPS); and Pharmacist Globert Mbayo (CAMELU). To address this situation, SIAPS provided technical support to the Provincial Malaria Control Program in 2015 to revitalize the CPM, which now serves as a framework for sharing information on procurement, distribution resources, and management. The security and availability of commodities depends on efficient interactions among all stakeholders. With funding from the President’s Malaria Initiative (PMI), SIAPS is supporting 25 health zones in Haut-Katanga in conducting malaria case management. The malaria commodities for SIAPS and SANRU/Global Fund are stored in same warehouse, as recommended by the CPM. In August 2015, 58,075 malaria rapid diagnostic tests (RDTs) owned by SANRU were at imminent risk of expiry, with a lifespan of four months. This quantity was more than the target needed, and SIAPS/PMI had RDTs with a lifespan of at least one year in stock. Through information sharing among the CPM groups that was facilitated and supported by SIAPS, aided by SIAPS-supported shared storage, the first expiry, first out method was used to ensure that RDTs in SANRU-supported health facilities that had a short life span were deployed first in SIAPS/PMI-supported health facilities through coordination with the National Malaria Control Program. The SIAPS RDTs with a longer lifespan were delivered to the Global Fund for deployment. By institutionalizing this approach through the CPM, 57,625 (99.23%) of the Global Fund’s RDTs that were at risk of expiry were able to be used, for a savings of USD 27,083.75. The CPM has also improved communication and created a dynamic group that includes both national and international stakeholders. Moreover, it has allowed better tracking of supplies and reduced wastage and expiry in a weak health system. The CPM also promotes advocacy by targeting other technical partners in emergency management. Finally, thanks to the CPM, no malaria commodity shortages were reported in 2015 or in the first half of 2016 in any supported health facilities in Haut-Katanga Province.